Wesley is a shy but loving five year-old but once he warms up he is energetic and likes to joke. He loves dinosaurs, Pokemon, Playdough, art and playing with his little brother! In June of 2017 Wesley started having pain in his leg. One day the pain would not go away, so his parents decided to take him to the doctor. Doctors weren’t overly concerned but decided to do blood tests. His parents were caught off guard when doctors said he had cancer. The bone marrow in his leg was so full of cancer cells that they were spilling into his bloodstream. 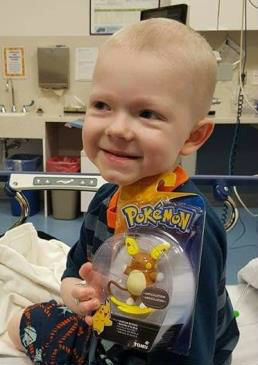 Wesley was officially diagnosed with Philadelphia Chromosome Positive Acute Lymphoblastic Leukemia. This means his cancer cells are mutated and the regular treatment protocol wouldn’t work. Wesley would need to be on a high risk protocol. Wesley’s treatments started immediately. Doctors placed a PICC line for fluids and later a port in his chest to help administer the chemotherapy. His treatments started with intense weekly chemotherapy under sedation which included chemotherapy via a spinal tap. Wesley has spent over 140 total days in the hospital over the past year and a half. He has endured three surgeries to place and replace a port in his chest as well as a G-tube. Chemotherapy treatments are now given via an IV once a month along with receiving steroids and oral chemotherapy at home. In spite of all of this, Wesley is a typical four year old who loves to share with others and watch shows that teach him things. His favorite colors are black and blue and he loves pizza, oatmeal, Lucky Charms and Gummy Bears. Wesley will be adopted as a Sparrow to West Sylvan Middle School. Students will work hard to not only love and support him, but raise money for Wesley through sponsored community service and fundraising.